Amanda started with PARDS at 12 years of age volunteering to muck stalls and feed the herd on weekends. 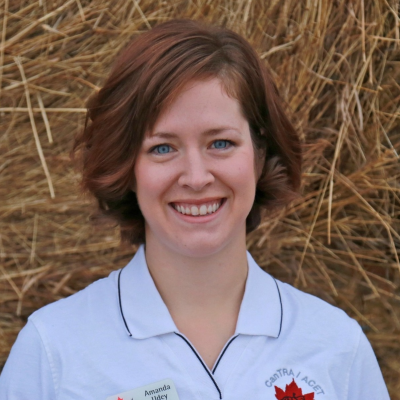 By the age of 16, she became a PARDS employee and achieved her Canadian Therapeutic Riding Association (CanTRA) Intermediate Instructor Certification in 2009. She holds English Rider Level 4 and Western Rider Level 2 and Level 4 in Signing Exact English (sign language). Amanda is presently at PARDS in a voluntary capacity. She willingly shares her time, knowledge and passion with us in a multitude of areas including therapeutic riding techniques, sign language, teaching lessons and has in the past, mentored PARDS instructors to achieve their CanTRA Certification for Therapeutic Riding Instructor. Amanda’s commitment and belief in the value of equine assisted therapy has enriched our organization and benefitted hundreds of our riders over the years.